For those without comedic tastes, the so-called experts at Wikipedia think they have an article about Friday the 13th. Friday the 13th, sometimes referred to as Black Friday or the day after Thursday the 12th, is a date on the Gregorian calendar when superstitious people go home, lock their doors, and try to forget about everything as quickly as possible. Such people believe in a correlation between this date and unusual or dangerous historical events; however, a random sample of Friday the 13th days shows no reason to draw such a conclusion. Friday the 13th is an unpopular choice for a wedding date. This often leads to discounts at wedding halls, particularly those with black cat decorations. On this day Margaret Huyton, of Lytham St Annes, Lancashire, suffered a fall while walking her dog Muffin to the Drysdale Mini Market. Falling on her hip, Mrs. Huyton suffered slight grazing and a tender bruise, as well as a hole in her dress which she later darned. Additionally, Mary-Kate and Ashley Olsen were born on this day, forever associating the date with wholesome family entertainment, and the hilarious comedy stylings of Bob Saget. In 2003, this date was calculated by Mulpert Dreardon, director of the Faculty of Physics at the London School of Economics, to be the slowest news day within all of recorded history. Nothing frightening about these girls. Right? January 13 was the 13th day of 1995. On this day, a small portrait of Doreen MacQuarie was stolen from her sitting room in Coolangata, Queensland. It was later recovered from beneath a park bench, having been stuck with bobby pins and rock candy by malicious tourists from Birmingham. Meanwhile, in an undisclosed location in the Welsh countryside, a group of part-time druids performed a secretive ritual, probably involving crystals. The ritual had no immediate effect, and the druid sect returned to their jobs as English Literature lecturers at various Home Counties universities. Several dangerous wolves were shot near Lyons, France on this day, by six overzealous members of the local gendarmerie. Victims of this rogue pack included three rabbits, a pair of naughty ducks, and a blueberry pie left on a windowsill to cool. The wolves killed stuff, too. In New Zealand, a sect of mild-mannered religious healers sacrificed a family of goats a the foot of Mount Taranaki, apparently for no reason whatsoever. For a time, locals believed the group to be a part of an apocalyptic cult. Shortly thereafter, following a sizeable anonymous donation of hush-money to every person within a 30-kilometre radius, all suspicious were forgotten. On this day, Resident Evil 5 was released, unfortunately. Additionally, an evil worldwide organisation of conspirators including Large Hadron Collider scientists, climatologists, and the aforementioned collection of religious cults, announced that over several decades they had subtly changed the gravitational field of the Earth so that an iron-rich asteroid passing near Earth would change course to destroy all life on the planet. This was explained to be necessary in order to purge the Unworthy, a designation that apparently includes every human and many livestock. Unfortunately this statement was universally ignored, as all of the geeks who would usually care were too busy killing zombies. 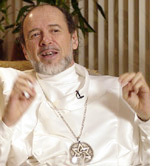 Was it the Raelians? Probably. It is predicted that on this day the near-Earth asteroid 99942 Apophis will pass near enough to Earth to be irreversably drawn towards the planet, crashing into Siberia and causing a 300-year winter. This will exterminate all mammalian life on the planet, especially humans, who probably had it coming. Too bad it's my birthday. This day will also mark the 100th anniversary of Adolf Hitler's first TIME Magazine cover, and is traditionally a day of feasting and celebration for neo-Nazi organisations. But I wouldn't get too worried about it happening on your street.